1School of Pharmaceutical Sciences, Shoolini University, Solan, Himachal Pradesh, INDIA. 2Department of Medical Parasitology, Post Graduate Institute of Medical Education and Research, Chandigarh, INDIA. 3Division of Pharmacology, Indian Institute of Integrative Medicine (CSIR), Jammu, INDIA. Background: Diabetes mellitus is enfeebling threatening diseases with continuously increasing rates of incidence and mortality and it may rise tremendously by 2025. Objective: Quercetin rich ethyl acetate fraction (PP-EtOA) of leaves of Prunus persica was evaluated for antidiabetic, anti-oxidant and anti-adipogenic activities. Material and Methods: Streptozotocin (STZ)-induced diabetic rat model, oral glucose tolerance test (OGTT) and normalglycemic rat models were investigated at the doseof 100 and 200 mg/kg,p.o. of PP-EtOA. Results: At 200 mg/kg, significant anti-hyperglycaemic activity(p<0.05) was observed in all the rat models. 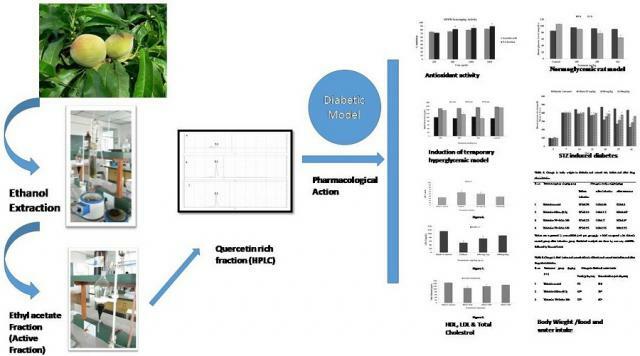 In STZ induced diabetic rat model, improvement in body weight and lipid profile was also observed.DPPH (2,2’-diphenyl-1-picrylhydrazyl) free radical scavenging method showed dose dependent scavenging. Preadipocyte differentiation assay (3T3-L1) showed significant inhibition of differentiation. HPLC fingerprinting analysis of fraction was also performed. Conclusion: PP-EtOA possesses potent free radical scavenging property. Its antihyperglycemic and antiadipogenic activities may be due to quercetin (flavonoid) and may prove to be effective in the treatment of diabetes mellitus and diabetes driven dyslipidemic conditions. Sharma G, Kumar S, Sharma M, Upadhyay N, Kumar S, Ahmed Z, et al. Anti-Diabetic, Anti-Oxidant and Anti-Adipogenic Potential of Quercetin Rich Ethyl Acetate Fraction of Prunus persica. Pharmacognosy Journal. 2018;10(3):463-469.